Buy furniture & handicraft items online in India like - solid wood furniture, wooden furniture online and interior decor items. We have found 12 URLs that are not SEO friendly! Your webpage has 48 'img' tags and 16 of them are missing the required 'alt' attribute. The size of your web page's HTML is 88.61 Kb, and is over the average web page's HTML size of 33 Kb. You should compress your HTML to reduce your page size and page loading times - this will help your site retain visitors and increase page views. If you were using compression, you could be compressing your HTML size by 87 % - from 88.61 Kb to 11.21 Kb which would further reduce your page loading time. Your site loading time is around 16.229 seconds and is over the average loading speed which is 5 seconds. 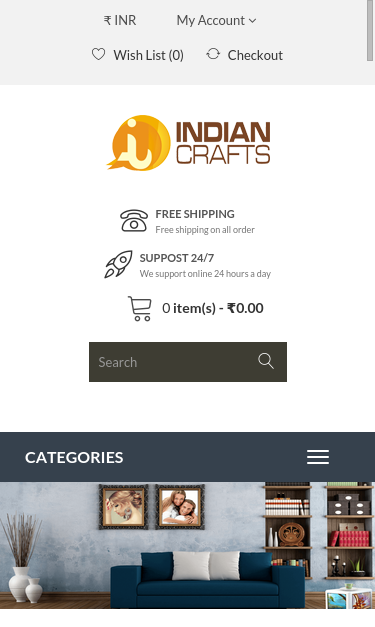 http://indcrafts.co.in and http://www.indcrafts.co.in/ should resolve to the same URL, but currently do not. We found 1 email addresses in your page code. We advise you to protect email links in a way that hides them from the spam harvesters. Buy furniture &amp; handicraft items online in India like - solid wood furniture, wooden furniture online and interior decor items.